Good Crappie 4-10-18 - Lake Houston Fishing! Fished from 7:30 to 10:00. 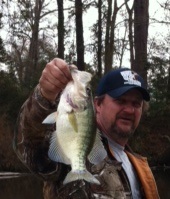 Had to go out and find fish since we failed to show at the Crappie Masters tournament. Weather was atrocious. These were caught in 6' to 8' of water on blue and white Jokers. The 9 came from the same brush pile. They ranged from 1.28 to 1.81 lbs. like they came out if the same mold. When y’all wanna run over there to do some scanning? What other lakes are they likely to throw bigger tourneys on? I went out yesterday after work, fished from 430 to 715 and ended up with 12 very nice crappie with one being over 2 pounds. All were also caught in the 8 foot depth range over brush. I caught all fish off the same brush pile. Great afternoon trip. really turn on the second week of april. or there abouts. Went out a few hours yesterday and caught 11 nice keepers. 8 feet water and fishing 4 foot deep Color black chart. 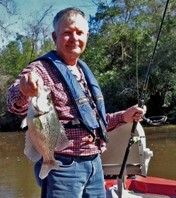 Went out today and let the wind blow me all over the bayou but did manage to put 8 keeper crappie in the chest. Fished 7 hours so that would make it about a fish every hour. Did catch my dip net back that l lost thrusday. Couldnt beleave that l got lucky and when l pulled up my anchor it was hooked up to it, thank god for it was a 35 dollar net that l have had for over 10 years. 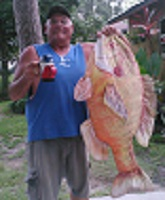 Nice fish KR! You know you've got a brute when those whites get that STEEP forehead on them.